Ben Robinson|GoBuccs.com Former Covington and Ohio University standout A.J. Ouellette was named Offensive MVP of the Gridiron Showcase. FORT WORTH, TEXAS — 2014 Covington graduate and former Ohio University star running back A.J. Ouellette has aspirations of reaching the pinnacle of football by earning a spot on an NFL roster this coming fall. To give himself the best possible chance, Ouellette is doing everything humanly possible to put his name out there for every NFL scout in hopes of being drafted in April. Yes, the odds of accomplishing his goal is staggering as just nine in 10,000 high school players (0.09%) and one in fifty collegiate players (2 percent) end up being drafted by an NFL franchise. Yet, Ouellette has beaten the odds before as he came out of high school without any scholarship offers and little interest from any Division I programs in the country. He walked on at Ohio University, quickly earned a scholarship and eventually became one of the best running backs in the history of the program. Now Ouellette is trying to beat the odds once again at the highest level of the sport. 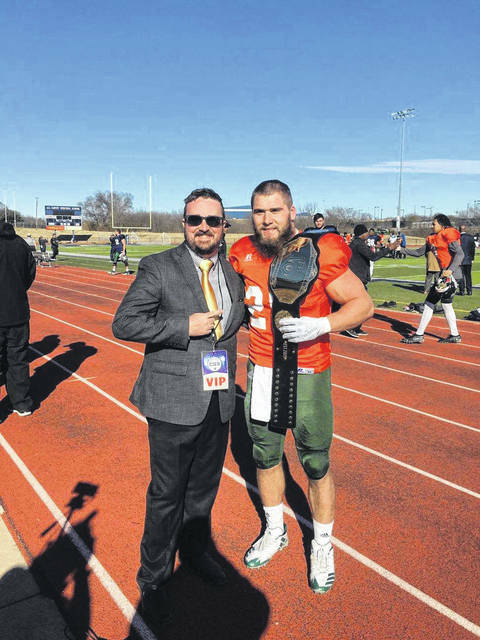 And last week Ouellette took a major step forward in accomplishing his goal as he took Offensive MVP honors at a Gridiron Showcase in Texas with NFL scouts on hand to witness his talent first hand. The showcase put prospects through a variety of situations, challenging them mentally and physically. And Ouellette rose to each occasion as he showcased his ability to adapt to any situation at a moment’s notice. Ouellette also had the opportunity to showcase his adaptability after other players were injured during the scrimmages. The results were what Ouellette had hoped for as he was interviewed by several NFL scouts and received the highest praise of any player who participated in the showcase. An impression Ouellette hopes leads to more interest down the line. Even with his big week in Texas, Ouellette isn’t about to sit back and “HOPE” for a chance. Instead, he plans to continue training extremely hard at Enhance U while his team works on getting him more looks from NFL scouts. As previously mentioned, the odds of anyone making it to the NFL is astounding. But don’t talk to A.J. Ouellette about odds because he’s beaten them before. And he’s well on his way to doing it again. https://www.dailycall.com/wp-content/uploads/sites/30/2019/01/web1_ouellette.jpgBen Robinson|GoBuccs.com Former Covington and Ohio University standout A.J. Ouellette was named Offensive MVP of the Gridiron Showcase.